Doctor Who: The Moffat Scripts – THE IMPOSSIBLE ASTRONAUT / DAY OF THE MOON | Warped Factor - Words in the Key of Geek. This is one small step for Dr. Moo, one giant leap for mankind. Steven Moffat kicks off series six with an explosive start in The Impossible Astronaut, beginning the season by having the Doctor recruit his friends to visit him in America before they all witness an Apollo astronaut shoot him dead, and so are forced to give him a funeral. Read that again: the new season of Doctor Who starts by killing off the Doctor. Whatever your opinion of Moffat you cannot deny how ambitious and brave he was writing that. There’s absolutely no warning, it comes completely out of nowhere, the Doctor dies, dead, no regeneration. DEAD. Funeral and everything. But these two episodes don’t let you to stop and catch your breath because as soon as you realise that you just saw the Doctor die Moffat throws another twist at you. Suddenly the Doctor’s back, but it’s actually a younger version. Then he, Amy, Rory and River find themselves recruited by President of the USA Richard Nixon (who looks a lot better than the frontrunner for next president that we have today, Watergate notwithstanding) to investigate a mysterious child that’s calling him everywhere he goes. When they discover the child she’s inside a spacesuit just like the one the Doctor’s companions saw earlier. Then we learn that there are monsters swarming all over the world manipulating the human race for their own ends, including the decision to go to the moon. Steven Moffat spent series five throwing away the shackles of the RTD regime, and now that he’s free to give us a rollercoaster ride of thrills and excitement he doesn’t disappoint. The entire thing is a high-adreniline exciting way to kick off the season that doesn’t let out. The twists just keep on coming and draw you in. After these two episodes you can’t help but demand to watch the rest of the season to find out what comes next. This is high stakes storytelling make no mistake about that. In all this we have one of the greatest monsters ever created in the history of the show: the Silents. Moffat creates a fundamentally creepy concept for them and makes them look like the stuff of nightmares (seemingly inspired by Edvard Munch’s painting The Scream). Coupled with their chilling voices, long bony fingers, slimy skin and the fact that they wear suits, they truly are a sight to behold. They are the best monster design in the whole of the revived series and I’d even suggest you have to go back as far as Davros (that’s 1975 by the way) to find a creature design that can rival them in the creepiness department. It’s not just the look that makes them scary though; it’s also the way that they influence their victims’ memories. Have you ever entered a room and forgotten why? If Moffat can take the most mundane aspects of everyday life such as forgetfulness and déjà vu then he’s done his job as a Doctor Who writer in traumatising generations. 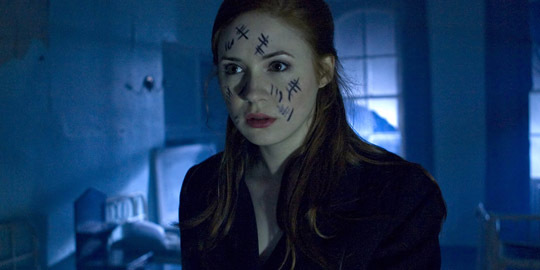 He adds some ingenious touches to this concept too, with the tally marks and voice recorders adding significantly to the overall scare factor of the second episode. Take the orphanage scenes from Day of the Moon, out of all the episodes of Doctor Who that have been made, I struggle to think of many moments scarier than those. And then in true Doctor Who style it’s their own skill set that is used to defeat them. Some criticise the way the Doctor is effectively ordering genocide (hypocritically the same people look the other way when the Tenth Doctor did it first) but this is the 11th Doctor we’re talking about here. His view of morality is not strictly black & white as it was for other incarnations. When his friends are in trouble, like Amy is at this point, he’s prepared to do anything. This is nothing we haven’t seen already from the 11th and it’s nothing we won’t see again, and frankly it’s very difficult to feel sorry for the Silents given what they’ve done to Amy and to the child version of River. I also have to praise the cast for this story because while thrills and scares are good it’s characters that make a story. 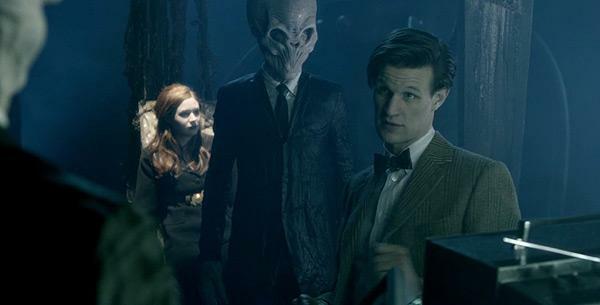 It should go without saying that Matt Smith, Karen Gillan and Arthur Darvill are all wonderful in this. Also superb is Alex Kingston reprising her role as River Song and we get to find out more about her origins through the underrated performance of Sydney Wade. The biggest twist in the story, and a contender for the biggest twist in all of Doctor Who, is the final scene when she regenerates. I’m willing to bet everything that nobody saw that one coming! 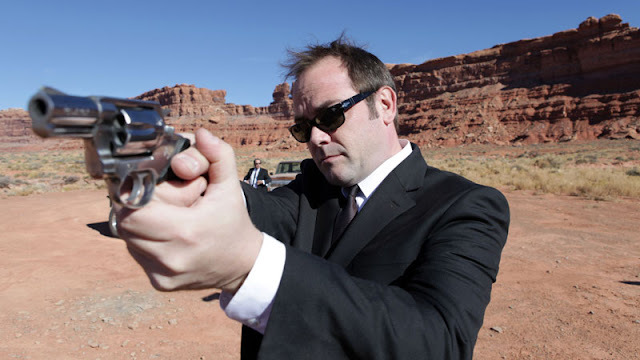 Richard Nixon is portaryed by Stuart Milligan, and he actually comes across through Milligan’s performance and Moffat’s writing as a real believable person. History has not been kind to this president and, never one to miss an opportunity for laughs, Moffat mocks this fact but also gives the character an honest portrayal. Nixon is presented as a man who tries to do the right thing with his position of authority but who still makes a few rash decisions. It’s refreshing to see him treated right. Yes, he made mistakes as president, but this story’s historical setting predates them. But the best guest performance comes from guest star Mark Sheppard because… well… because he’s Mark Sheppard and it’s a sci-fi series he hadn’t been in yet. He’s brilliant in this as a shoot first ask questions later FBI agent and his character Canton Delaware makes for a memorable and enjoyable one-off companion. (If only he didn’t share his name with the worst Doctor Who theme variation ever!) Canton is a genuinely witty character, he provides a positive representation of LGBT people and he is also a total badass – mess with him at your peril. He’s a magnificent character. Bring him back please! In this fantastic two-parter Steven Moffat sets up a lot of plots for future episodes of the season. This can have the effect of alienating some viewers but if you ask me I think the idea of TV shows always being self-contained stories in every episode is a thing of the past. Shows need to have a storyline that continues throughout the whole series and Doctor Who should be no exception to this rule. 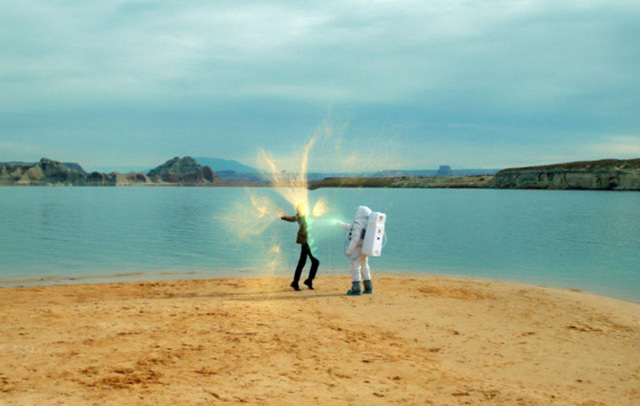 The Impossible Astronaut/Day of the Moon manages to do that while also delivering a top quality essence of everything Doctor Who is at it best – scary, tense, funny, unpredictable and ambitious – and so we can say with confidence that this story is a resounding success.